Has there ever been a movie with a less boy-friendly title than The Princess Bride? (I mean, no wonder a wary Fred Savage wrinkles his nose and asks, “Is this a kissing book?” when grandpa Peter Falk starts to read.) It’s something of a miracle that the younger me — two months shy of my tenth birthday — even saw it as a kid, but as memory serves, I was there on opening weekend, and now, with all the sophistication and insight that supposedly accompanies my decade-plus of experience as a film critic, The Princess Bride remains the one film I’d salvage in a desert-island scenario. 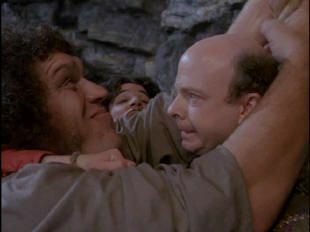 Not Raiders, not Star Wars, but this, a mushy “kissing” movie. In a sense, The Princess Bride does for fairy tales what the other two did for B-movie adventure serials and sci-fi epics, delivering a “good parts version” that trimmed all the talky, boring bits and focused on nothing but those elements audiences loved (though it’s worth noting that William Goldman’s novel was published a good four years before Star Wars). With age has come the realization that those dull stretches that make movies boring for kids may actually contain the most compelling aspects of any story and that there’s actually something lost in the thrill-ride school of contemporary blockbuster pacing, but that’s another conversation altogether. What’s worth noting here is how The Princess Bride — which has been released in at least five distinct editions since the DVD format was introduced — has finally achieved definitive, must-own status via Blu-ray (which isn’t to say that suckers like me weren’t re-buying it every step along the way). Even if you don’t own a Blu-ray player (or, more to the point, would rather not be limited to watching the movie on the one screen in your house connected to a Blu-ray device), this is the version to get, since it includes a bonus copy of the 20th-anniversary DVD as well. The transfer itself rivals what we saw in theaters so many years ago (good luck finding a print that good today), and the package itself rounds up all the noteworthy extras produced for previous editions. It’s a perfect solution, since at this late stage, nobody’s buying The Princess Bride to see what new featurettes the studio can cook up, but they certainly don’t want to toss an old copy for one that offers fewer extras, as a surprising number of Blu-ray releases have done. Still, they’ve added a couple new goodies. “Love Is Like a Storybook” features what looks like a collection of graduate students weighing in on the film’s fairy-tale appeal, and “The Dread Pirate Roberts: Greatest Pirate of the Seven Seas” is a faux mini-doc about whether the character really existed. A handful of legit pirate experts mumble their thoughts in low-grade video interviews, while another fellow named E.L. Rawscey disputes Roberts’ very existence. The twist: That’s Cary Elwes in old-dude makeup (and a “fat suit” cultivated in the twenty-odd since he played Roberts) doing his best John Cleese-style British twit impersonation — a clever, if decidedly unnecessary addition. But it’s the old stuff prepared for earlier releases that fans will find most appealing. The set boasts two commentaries, one from Goldman (who sounds surprised by how well the film turned out, and given the fate of some of his other projects, who can blame him? ), the other from director Rob Reiner (who confesses that The Princess Bride was his favorite book growing up and still can’t seem to believe that he landed the chance to direct it). Both commentaries peter out in the last half hour of the film, with the pros falling under the film’s spell and saying little from the “mawwiage” scene on. Goldman recalls other fates the film might have taken (at one point, Norman Jewison was lined up to direct) and shares memories from his one day on set (who ruined one take by shouting “fire!” during the Fire Swamp scene). Reiner is full of satisfying behind-the-scenes details, pointing out everything from the hat he wore in Spinal Tap (which composer Mark Knopfler insisted be featured in the film before taking the project) sitting on a lamp in the Fred Savage scenes to the ways the production disguised Andre the Giant’s bad back by using not-quite-giant-sized body doubles and off-camera ramps. Turns out Reiner voiced the R.O.U.S.s himself. And he explains why the book’s “Zoo of Death” became the “Pit of Despair” (though you might guess, considering that the film was budgeted at an astonishingly low $16 million). 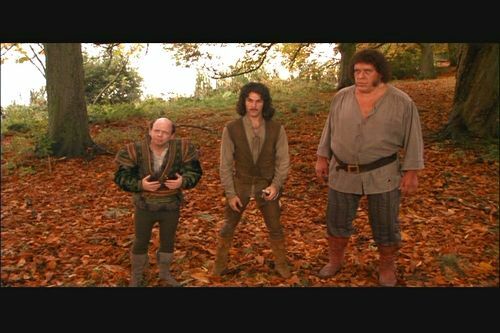 But the best extra, in my opinion at least, is the ridiculous trailer Fox used to sell the film — alarming evidence that the studio had no idea how to market The Princess Bride, and indeed, it wasn’t until home video that audiences truly embraced the strange, self-conscious mix of comedy, swashbuckling, romance and adventure. Hard to believe in the age of Shrek.